Are you thinking about hiring a painting company to help create the best study room, or maybe do it yourself, but aren’t sure what colour to choose? Then this is the guide for you! Discover the best wall colours to design a productive oasis. While oranges tend to invoke energy and aren’t conducive to a study room, the lighten peachy hue of Honeybell can do wonders for your productivity. It’s bright enough to stimulate your brain without causing unnecessary distractions. This is a refreshing colour that will bring balance between productivity and relaxation for your study room. While adding colour to the room, the pale green isn’t such a bright colour that you’ll get distracted from your task at hand. Greens, in general, have a balancing effect. As a mixture of the happy and welcoming feeling of yellow, and the calming influence of blue, green is a great colour for a study space, particularly slightly darker tones. It’s favourable to long-term concentration and clarity. Provides much of the same effects that you get from a pale green paint job, but with a bit more relaxation thrown in there. Pale blue is perfect if you want to create a serene space. Blues, in general, are a very calming and comforting hue. As a mixture of blue and green, turquoise is a tranquil colour that will coat the room in waves of relaxation while helping to improve overall productivity. This colour is a great choice to help intensify your work efficiency without making you go crazy. If your work involves creativity in some aspect, purple should be your go-to colour. Depending on the type of work you’re doing, you might gravitate towards a darker, exciting shade or a soothing lighter one. Whatever you choose, your study will be full of interest and wonder. Neutral tones like this warm, soft mocha and other tans are great for enhancing focus in a serious space like this. You can use them to play up other colours or keep it by itself to create a peaceful atmosphere. Calming and peaceful, gray helps to keep you focused and on task, especially if you have an overwhelming amount of work to get done in a short amount of time. This colour is known for creating an environment that’s both friendly and focused. As with other neutrals, adding a bright colour to the mix will as interest and prevent your study room from boring you to sleep. A popular neutral that works best to accent brighter colours in a room to add interest. Or you could go for a clean, minimalistic, off-white room with the sole purpose of getting work done. A bright space like that is bound to spark a grand idea or two. 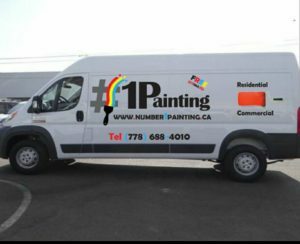 At Number 1 Painting, we’re a professional painting company dedicated to helping both residential and commercial clients. Located in Coquitlam, BC, we provide high-quality services at reasonable prices throughout the Lower Mainlands. Our team works closely with everyone involved in the process, from homeowners to interior designers. Rated number one in customer satisfaction from our clients, call today to book an appointment.